A visit to a hill tribe village is one of the main reasons why people travel to Thailand's far north. There can be few other places on earth where so many varied, exotic and fascinating cultures coexist side-by-side in apparent harmony. To be sure, similar hill tribe groups live nearby, in neighbouring Burma, South China, and Laos; yet the former remains troubled by ethnic insurgency, its upland areas closed to foreign travellers for decades, whilst facilities for visitors to minority areas of South China are still rudimentary, and in Laos virtually non-existent. North Thailand, by contrast, seems to offer everything - magnificent scenery, easy access, and in the nearby lowlands comfortable accommodation, together with some of the most delectable regional and national cuisines to be found anywhere in the world. At just over half a million people, Thailand's hill tribe population constitutes just under 1% of the total population of the country. Most hill tribes live in the highland areas of the north, as well as along the mountainous western border with Burma, farming lands which are unsuited for the wet-rice paddy cultivation practised by the lowland-dwelling Thais. It is because they live in the mountains that these diverse minority peoples are known to the Thais as chao khao, or "people of the hills". In fact, the term "hill tribe" is something of a misnomer; they are not "tribes" in an anthropological sense, and "hill peoples" or even "highlanders" would certainly be a more accurate translation. Be this as it may, the designation "hill tribe" is widely accepted and must be considered standard current usage. In normal circumstances, national frontiers are fixed in an attempt to define the territorial limits of land inhabited by particular peoples. West of a certain river - the Yalu, for example - the majority people are Han Chinese; east of it they are Korean. No such simple solutions are possible in the hills of Southeast Asia, however. Valleys are inhabited by wet-rice agriculturalists like the Thai, the Lao, the Burmans and the Han Chinese. The lower slopes of the hills, unsuited for wet rice paddy cultivation, are inhabited by dry rice farmers such as the Karen, Lawa, Khamu and H'tin. The higher slopes are farmed by slash-and-burn agriculturalists like the Lahu, Lisu and Mien, who grow temperate vegetables and opium poppy to eke out their dry rice crop. Finally, clinging to the very highest peaks and farming the remotest hill tops, may be found the Akha and the Hmong, the two groups traditionally most closely associated with papaver somniferum, the delicate opium poppy which flourishes best at these high altitudes. The resulting mosaic of peoples is as culturally rich as it can be ethnically confusing, and lends Thailand's hill tracts much of their charm. The Tribal Research Centre at Chiangmai University currently identifies nine separate hill tribes who have indigenous status within Thailand. They can be conveniently divided into two groups. The people of the lower slopes, including the Karen, Lawa, Khamu and H'tin; and the true "highlanders" including the Hmong, Akha, Lahu, Lisu and Mien. Each tribe upholds its own traditions, wears a distinctive style of dress, and speaks its own language. In addition to these relatively established groups, various other hill peoples, usually recent migrants of refugees from Laos and Burma, have recently settled in Thailand. These peoples, including the Palaung from Shan State and the "long-neck" Padaung from Kayah State, are regarded as temporary residents of Thailand and not accorded hill tribe status by the Thai authorities. There are more than a quarter of a million Karen living in Thailand, mainly scattered along the western border contiguous with Burma's Karen State. They are skilled farmers, specialising in both wet and dry rice cultivation. Although they employ slash-and-burn techniques, they create less environmental damage than the people of the mountain peaks by maintaining belts of forest between their fields. Indeed, in some ways the Karen form a link between the hill peoples and the lowland Thai. Like the Thai, they live in stilt houses, and they have been resident for centuries. Unlike the other hill tribes, they do not move their villages. The Karen are largely animist, although sections of the population have embraced Buddhism, and in nearby Burma Christianity has a very strong presence. Karen women are excellent weavers, producing rather mellow red, orange, pink and white cotton cloth. There are two main groups of Karen living in Thailand, the Sgaw and the Pwo. Unmarried girls in both groups may be distinguished by their white clothing. Whilst Karen clothing and customs are in some ways less spectacular than those of the high mountains tribes, trekking in Karen areas can be particularly rewarding for travellers interested in white-water rafting and elephant riding. It is very easy for travelers to book their stay through Expedia. A visit to Mae Sam Laep, a Karen village on the banks of the Salween, offers spectacular views and the chance to explore stretches of this treacherous, cold and mysterious river by long-tail speedboat. Soldiers of the Karen National Union, who have been fighting for an independent Karen State for more than 40 years, can sometimes be seen on the opposite bank - as can soldiers of the SLORC, still seeking to put down the rebellious Karen. Other "people of the lower slopes" including the Lawa, Khamu and H'tin, are rarely visited by travellers, partly because they lack spectacular costumes, and partly because they do not grow opium poppy and are not associated with the romantic mythology of the Golden Triangle. Living at progressively higher levels in the remote mountains of the north are the real "highlanders" of the Golden Triangle - Hmong, Akha, Lahu, Lisu and Mien. These are the peoples, all relatively recent migrants to the area, whose exotic and colourful clothing, association with opium cultivation, and picturesque life-style has given trekking in Thailand so much international appeal. There are about 80,000 Hmong in Thailand, belonging to two distinct groups, the Blue Hmong - distinguished by the knee-length pleated skirt of the women - and the White Hmong, the womenfolk of whom wear blue or black trousers. The Thai (and the Chinese) call these people "Meo", a name which the Hmong dislike and consider derogatory. They are clever business people, and show their wealth in displays of massive silver jewellery. The Hmong are a very independent people who resent any attempt by lowlanders to change or influence their lifestyle. Accordingly, they have often been involved in military conflicts, including - in neighbouring Laos - the CIA "secret war" of 1968-75. Until recently they practiced extensive opium cultivation in Thailand; elsewhere, in Burma and Laos, they still do. There are just over 60,000 Lahu living in Thailand, sub-divided into five separate groups, the Red Lahu, Black Lahu, Lahu Sheleh, Lahu Balan, and Lahu Bankeo. They are known to the Thai as "Musur", which means 'hunter', as they excel at this skill. The Lahu are an animistic people, though in recent decades many have been converted to Christianity. Many Lahu are poor, and as a people they are noticeably less well off than groups such as the Hmong, Lisu and Mien. 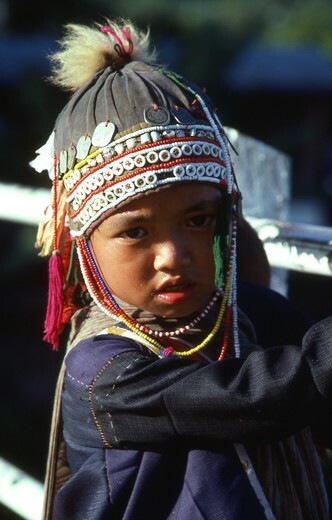 The Mien, called Yao by the Thais, are the most sinicised of the hill tribes. There are about 36,000 living in Northern Thailand, and are easily distinguishable by the broad black turbans and red "boas" worn by their women. They are arguably the most sophisticated of the hill peoples, with a long tradition of writing in Chinese ideographs, a deep-seated belief in Taoist-based religion and ancestor veneration. Mien embroidery and paintings are keenly sought after by visiting tourists, and fetch high prices in the Chiangmai Night Bazaar and elsewhere. Like the Lahu, the Akha are a relatively poor tribe living on the very tops of the most inaccessible peaks. Of Tibetan origin, they are the most recent hill people to have migrated to Thailand, and they are perhaps the least conversant with Thai as a language. They are immediately distinguishable by the elaborate and beautiful headgear of the women - perhaps the most remarkable single feature of Thai hill tribes. Today there are about 33,000 Akha living in Thailand, practising shifting cultivation of various crops including maize, dry rice and temperate vegetables. Until recently the Akha were deeply involved in opium cultivation, and even today many villages are wracked by problems of opium addiction. They are often shy and even timid by nature, and visitors to Akha villages should take extra care to speak gently and avoid giving offence. By contrast, The Lisu are of a completely different nature, outgoing, confident and sometimes even a little pushy. They have been established in Thailand since the beginning of this century, and today there are perhaps 25,000 in the country. Lisu women wear colourful red and turquoise dresses, often with large amounts of elaborate and heavy silver jewellery. More than any other hill tribe, including the Karen, the Lisu seem equipped to deal with and even thrive in lowland Thai society. As a result many live in quite elaborate, comfortable houses, and run thriving businesses in the big cities like Chiangmai and Chiangrai. They are generally ebullient, outward-going and friendly, whilst the Lisu girls are perhaps the prettiest and the most flirtatious in the hill country! Undoubtedly the most popular and most adventurous way to visit Thailand's hill tribes is by trekking. Before embarking on such a venture, however, it is important to consider your state of health and physical condition - trekking isn't for everybody, and even a short one or two day expedition requires a degree of personal fitness not everyone is fortunate enough to enjoy. Those who consider themselves too old, too infirm, or just too plain cautious to march off into the hills need not despair - Chiangmai, Chiangrai, Mae Hong Son and Nan all boast numerous agencies offering one or two day tours of hill tribe villages by air-conditioned coach. True, this restricts visitors to surfaced roads, and therefore to the more commercialised hill tribe villages. Nevertheless, touring is an easy, safe and comfortable way to see something of the hill peoples and to buy hill tribe handicrafts without excessive physical effort. For those who have the time and the inclination, as well as a reasonable degree of physical fitness, trekking in the hills of Northern Thailand is an experience not to be missed. Trekking is big business, of course - in Chiangmai there are currently more than two hundred agencies offering organised treks, and there are many more throughout the cities and towns of the region. Most visitors to north Thailand choose to join an organised trek arranged by a professional agency familiar with the terrain and people to be visited. A typical trek is of three to five days duration, and an ideal group size is four to eight people, including two guides. Most treks begin with a few hours journey in a jeep or a pick-up to the area to be visited. Where the road ends, the walking begins. Trekkers should expect to walk for between three and five hours a day, usually up hill and down dale, and generally under a hot sun where no forest cover exists. In well-organised treks, some of the journey will be by elephant back, and some by bamboo raft - sometimes on fast "white water" rivers. In the Burma frontier area, or near former Chinese Kuomintang settlements, mules are also used as a means of transport. Trekkers usually share communal accommodation, often in the village headman's hut. The guides are responsible for cooking communal meals with food generally carried in from outside. This is good sense, as hill tribe standards of hygiene often leave something to be desired, and the risk of contracting hepatitis or food poisoning from eating locally prepared food should not be ignored. After dinner traditional songs and dancing may be performed by the villagers, who are generally pleased to welcome visitors from the world outside. Bedtime is usually early - something all but the fittest of trekkers is likely to welcome - and fairly spartan. Set against this are the joys of sunset and sunrise in often pristine surroundings, miles from the nearest karaoke, go-go bar or office block. The complete absence of roads makes the nights almost eerily quiet, and the first light of dawn should be enhanced by ethereal wisps of mist - not fogged by poisonous exhaust fumes. Truly, a night on a hard bed or a simple mat is a small price to pay for such a sea change! It is also possible for adventurous travellers to visit hill tribe villages independently, and to make all their own arrangements without the help of an agency. Most enthusiasts of "do-it-yourself" trekking have often started with organised groups, and subsequently progressed to individual trekking. Whether experienced or not, independent trekkers should plan their route carefully, seeking advice from other travellers and if possible visiting the Tribal Research Institute at Chiangmai University before setting out. DK Books in Chiangmai publish two excellent maps for individual trekkers, one of the Wawi area south of the Kok River in Chiangrai Province, and the other of the Kok River itself. Both areas offer the possibility of rewarding visits to different hill tribe communities, and both are considered safe for independent trekking. It is not necessary or advisable to carry large amounts of money on independent treks - just enough to pay for basic foodstuffs which can be purchased en route, plus a little extra to see you back to the nearest city in case of sickness or other difficulty. Northern Thailand is home to a dozen minority hill peoples living in more than eight thousand villages scattered over more than one hundred thousand square kilometres of rolling, forested, often inaccessible hills - so the problem isn't so much finding a trek, as knowing which to choose, and where to start! The main trekking areas are Chiangmai, Chiangrai and Mae Hong Son provinces. A less well-known alternative which is likely to develop rapidly as Laos opens to the outside world is Nan, in the far north-east. Trekking to Thailand's hill tribe villages first gained popularity as an adventure holiday some twenty years ago, when Chiangrai province north of the Kok River was the major destination. By 1985 it was recognised that this area had become "over-trekked", so tours moved south of the Kok River to the Chiang Dao ["City of Stars"] region in Chiangmai Province, and to the Doi Chang ["Elephant Mountain"] region of Chiangrai Province. Today both areas remain important destinations, as does Mae Hong Son province on the remote Burma frontier, and Nan Province along the distant border with northern Laos. Broadly speaking, Chiangmai remains the most convenient destination with the greatest variety of hill tribes for the first-time visitor, added to which are the advantages of direct flights from Singapore and Kunming, a broad range of excellent accommodation, fine restaurants, and the many unique cultural attractions available in the northern capital. Chiangrai offers the most exciting rafting-trekking tours in Thailand, as well as a broad range of hill tribes. Mae Hong Son is Thailand's most "Burmese" province, with a spectrum of hill peoples which includes the "long-neck" Padaung more commonly associated with Shan State. Nan is the least-visited odd-man-out, with such lesser-known (and less visually spectacular) groups as the Mlabri, H'tin, and Khamu. Against this, Nan also boasts the most pristine hills, the lowest number of tourists, and spectacular vistas of the mighty Mekhong River. The best time to go trekking in Northern Thailand is during the cool, dry season between October and February. March and April, although still dry, can be uncomfortably hot. During the wet season - between, approximately, May and September - paths are muddy, walking can be difficult, and troublesome pests like mosquitoes and leeches are at their worst! At least two changes of light, loose, comfortable clothing. Long trousers, rather than shorts, to guard against thorns. To prevent sunburn, arms should be covered, and a broad-brimmed hat is a good idea. Strong boots, with ankle support, are ideal, though in the dry season good trainers will suffice. Nights can be surprisingly cold, especially during December and January, so in these months a light jacket or woollen, as well as a spare blanket, are essential. Other necessities include a towel and toiletries, insect repellent, antiseptic, antihistamine and anti-diarrhoea medicine. Drinking water is generally provided by the trekking company and carried by the guides. Most trekking agencies will also provide a back pack on request. It is not necessary to take large amounts of money, credit cards, or passports - though a photocopy of the latter should be carried at all times. Documents, jewellery and other valuables should be left in a bank safety deposit box. Trekkers who leave their credit cards in guest houses for safe keeping sometimes return home to find large amounts have been illegally charged to their account! Hill tribe villages are fascinating and picturesque, but not always very clean. The hill peoples themselves will have acquired a certain natural immunity, but inoculation against hepatitis and an appropriate anti-malarial are strongly advised for outsiders. Check with your doctor before travelling to Thailand, or seek advice at one of the many excellent hospitals in Chiangmai or Chiangrai upon arrival. Dietary caution should be exercised. Avoid unboiled or untreated water, peeled fruit and uncooked vegetables. Trekking with an established agency is generally quite safe - though it is sensible not to make a display of excessive wealth in remote areas close to the Burma frontier. Independent trekking is best limited to internal areas, well away from the troubled Burmese border. Those setting out on such treks should always check with the local police, and make sure they leave a record of their planned itinerary with friends. Don't take anything with you that you can't afford to lose, and in the unlikely event that you are robbed, don't offer resistance. Organised treks should cost between US$ 10 and US$ 20 per head per day at the lower end of the price scale. If rafting and elephant riding are also included, these costs may rise to between US$ 20 and US$ 40 per day. It is not difficult to establish the current going rate - just ask around at several of the many different agencies. Don't choose a trek by price alone. Take time to talk with other travellers before approaching an agency. When selecting an agency, make sure that it is registered (as required by law) with the authorities, and that it reports to the Tourism Authority of Thailand before starting a trek. The TAT is making efforts to control trekking agency standards, and recommends that travellers trek only with members of the Professional Guide Association of Chiangmai or the Jungle Tour Club of Northern Thailand. The price of a trek should generally include: all motor transport, food (three meals a day), accommodation in the villages visited, and sometimes the loan of specific equipment such as water bottles, back packs and (in the cool season) sleeping bags. Check these services are provided before booking a trek. Beverages other than drinking water and tea are not usually included in the price. Each hill tribe has its own specific language which few Thais, let alone outsiders, can speak. Nearly all hill people can speak northern or central Thai, but this too is of little help to foreign visitors - Thai is not a language to come to grips with in a short period of time! As a consequence, most travellers will have to rely on their guides as interpreters - most guides speak adequate English, but it is advisable to check. Chinese visitors from Taiwan and Singapore, or residents of Hong Kong who speak Mandarin, will be pleased to learn that Yunnanese Mandarin is widely spoken as a lingua franca throughout the Golden Triangle area. This is because of the near-monopoly on local trade held by Yunnanese traders and ex-Kuomintang soldiers, known locally as "Chin-Haw".